The grave violations of human rights against the rights of prisoners and detainees in prisons and detention centers have increased at an unprecedented pace, especially in terms of the increasing methods of repression, violence and torture, which are no longer limited to physical detention, but all forms of violations and physical, moral and punitive practices of prisoners and prisoners Torture in addition to the policy of medical negligence, denial of visits by parents to their detained children, solitary confinement, collective and individual punishments and other violations contrary to the Third Geneva Conventions and Fourth, and contrary to the values and principles of the Universal Declaration of Human Rights and international conventions against torture, which considered that torture may amount to crimes against humanity. 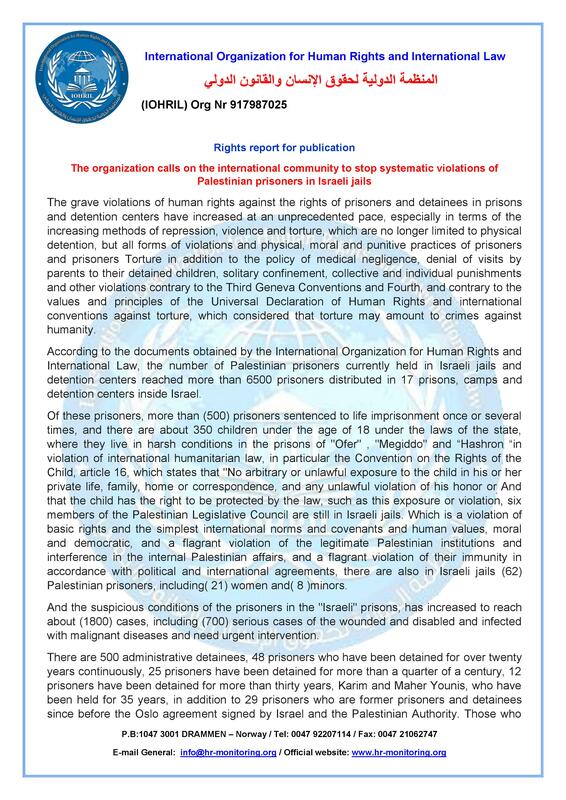 According to the documents obtained by the International Organization for Human Rights and International Law, the number of Palestinian prisoners currently held in Israeli jails and detention centers reached more than 6500 prisoners distributed in 17 prisons, camps and detention centers inside Israel. 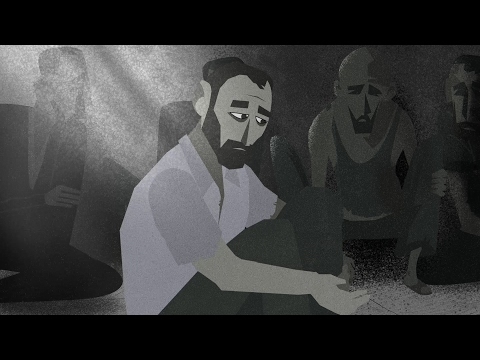 Of these prisoners, more than (500) prisoners sentenced to life imprisonment once or several times, and there are about 350 children under the age of 18 under the laws of the state, where they live in harsh conditions in the prisons of "Ofer" , "Megiddo" and “Hashron “in violation of international humanitarian law, in particular the Convention on the Rights of the Child, article 16, which states that "No arbitrary or unlawful exposure to the child in his or her private life, family, home or correspondence, and any unlawful violation of his honor or And that the child has the right to be protected by the law, such as this exposure or violation, six members of the Palestinian Legislative Council are still in Israeli jails. Which is a violation of basic rights and the simplest international norms and covenants and human values, moral and democratic, and a flagrant violation of the legitimate Palestinian institutions and interference in the internal Palestinian affairs, and a flagrant violation of their immunity in accordance with political and international agreements, there are also in Israeli jails (62) Palestinian prisoners, including( 21) women and( 8 )minors. And the suspicious conditions of the prisoners in the "Israeli" prisons, has increased to reach about (1800) cases, including (700) serious cases of the wounded and disabled and infected with malignant diseases and need urgent intervention. 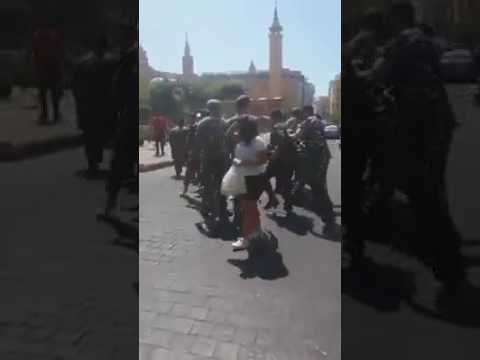 There are 500 administrative detainees, 48 prisoners who have been detained for over twenty years continuously, 25 prisoners have been detained for more than a quarter of a century, 12 prisoners have been detained for more than thirty years, Karim and Maher Younis, who have been held for 35 years, in addition to 29 prisoners who are former prisoners and detainees since before the Oslo agreement signed by Israel and the Palestinian Authority. Those who were supposed to be released in the fourth installment in March 2014, but the Israeli government, renounced the agreements and kept them hostage in its prisons. The Israeli security services use many systematic methods to torture Palestinian detainees in interrogation rooms. The method of stealth, sleep deprivation, loud music, beatings, shaking and threats of physical exploitation, violent restraint of hands and feet, and exposure of the accused to strong lighting and pressure on the neck, and exposing the prisoner to high temperature sometimes and cold at other times, such methods are contrary to international laws and customs, the Universal Declaration of Human Rights, in its article 2, affirms that no exceptional circumstances may be invoked under any circumstances, a state of war or threat of war, political instability or any other public emergency as a justification of torture, Israeli intelligence services use various methods of torture in order to influence the prisoners and the removal of confessions by force, which violates the rules of international law and international humanitarian law and all international conventions. 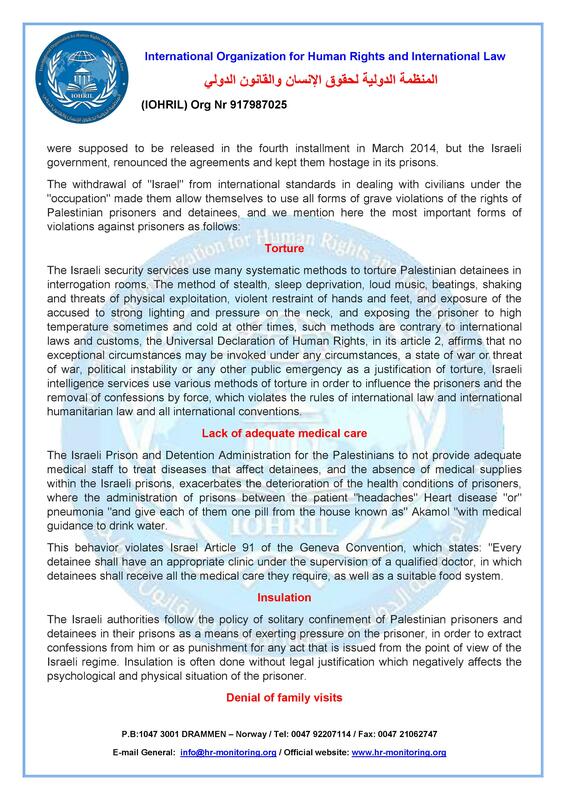 The Israeli Prison and Detention Administration for the Palestinians to not provide adequate medical staff to treat diseases that affect detainees, and the absence of medical supplies within the Israeli prisons, exacerbates the deterioration of the health conditions of prisoners, where the administration of prisons between the patient "headaches" Heart disease "or" pneumonia "and give each of them one pill from the house known as" Akamol "with medical guidance to drink water. 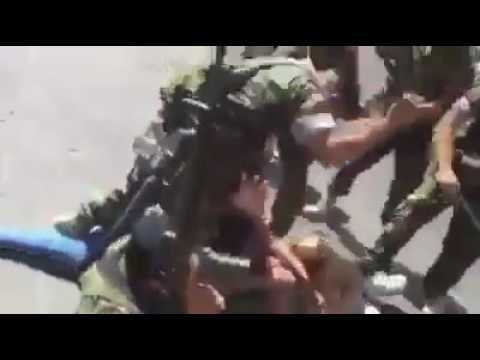 This behavior violates Israel Article 91 of the Geneva Convention, which states: "Every detainee shall have an appropriate clinic under the supervision of a qualified doctor, in which detainees shall receive all the medical care they require, as well as a suitable food system. The Israeli authorities follow the policy of solitary confinement of Palestinian prisoners and detainees in their prisons as a means of exerting pressure on the prisoner, in order to extract confessions from him or as punishment for any act that is issued from the point of view of the Israeli regime. Insulation is often done without legal justification which negatively affects the psychological and physical situation of the prisoner. The transfer of Palestinian detainees inside Israel is contrary to the rules and provisions of international humanitarian law, in particular the Fourth Geneva Convention, and their transfer means that they are denied access to their families. The International Committee of the Red Cross program of visits to families of detainees is severely restricted and complicated. 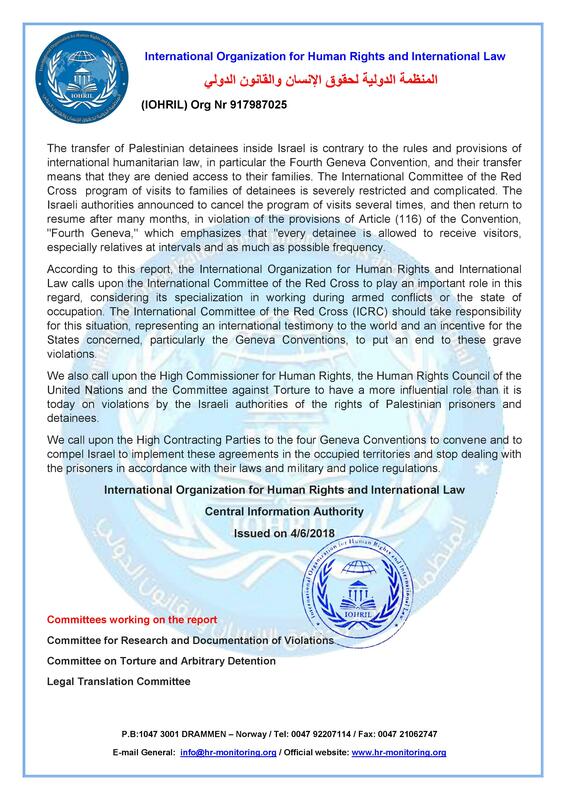 The Israeli authorities announced to cancel the program of visits several times, and then return to resume after many months, in violation of the provisions of Article (116) of the Convention, "Fourth Geneva," which emphasizes that "every detainee is allowed to receive visitors, especially relatives at intervals and as much as possible frequency. According to this report, the International Organization for Human Rights and International Law calls upon the International Committee of the Red Cross to play an important role in this regard, considering its specialization in working during armed conflicts or the state of occupation. The International Committee of the Red Cross (ICRC) should take responsibility for this situation, representing an international testimony to the world and an incentive for the States concerned, particularly the Geneva Conventions, to put an end to these grave violations. We also call upon the High Commissioner for Human Rights, the Human Rights Council of the United Nations and the Committee against Torture to have a more influential role than it is today on violations by the Israeli authorities of the rights of Palestinian prisoners and detainees. We call upon the High Contracting Parties to the four Geneva Conventions to convene and to compel Israel to implement these agreements in the occupied territories and stop dealing with the prisoners in accordance with their laws and military and police regulations.